1st June 2012. Spring Bank Camp at Drum Hill. Saturday 2nd - Annette and I are woken at 5:30 am by a cub from a bordering camp site. He is talking loudly to his friend about all sorts of thinks, he is shocked when he is told the time and realises how long he has to wait before he can get up. We have a cup of tea and listen to Leonardo a bit longer. I get up at 7am. Ben, Luke Ba and Josh cook the breakfast under my supervision. Bacon, scrambled egg, beans and tomato. We all go down for flag break. I hand over site control to Austin, who is still in bed. We send them off for activities at 10am, with out realising that they start at 9:30am. For some reason everyone’s Mobile phone seems to have discharged overnight. The weather to generally good but cloudy. We eat lunch in the party tent with lots of Jubilee cups, hats, plates, flags, napkins, etc. A bit of a rush round when we had forgotten that one of the scouts was due to leave mid afternoon. We have curry and rice for tea, served at 6:40. We have 12 cups of rice for 24 people and about 8 would have been fine. They go off to the talent show. We pay a visit to Dave's bar for a couple. Serve supper of hot chocolate and biscuits at 10pm, they are all asleep a lot sooner that last night. 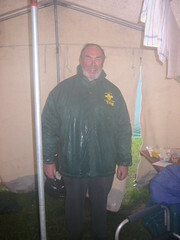 Sunday 3rd - Heavy rain from the start and continues all day. I get up at 7am, Jack, Izaac and zzt cook the bacon, I do the eggs, serve egg and bacon cobs. Matt takes them down to flag break. After breakfast Annette goes home for a shower and to fetch more stuff. They go off to the activities in the rain. 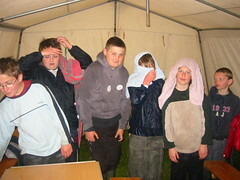 Thomas, Alex and Joe P come over for a warm in the mess tent. Paul Gant comes to visit and brings his two kids. Paul Lambkin also pays a visit. We have the gas burners on most of the day to dry clothes. Austin leads the potato pealing team in the afternoon, helped by Adam and others. I have a go at some Woggle making with some of them, we go exploring round the site looking for suitable pieces of wood. Trig calls round in the afternoon. Sausage, mash and beans for tea followed by sponge roll and custard. They take some persuading to go to the disco in the evening but most enjoy it when they are there. Matt takes them to watch the fireworks at 10:30pm. We play cards with Austin and Sam in the mess tent. I play “Go fish” for the first time. Annette goes down to the bar for a while, plays some drinking games with Tina and George. She pretends not to understand the rules of “Go Fish” when she gets back to amuse Austin. We teach them Speed cards later, which results in most of a bottle of Valpolicella ending up on the floor. Thomas and Alex work the night shift on the Safety team and nip in to see us later. All quiet from 1am. Monday 4th - Annette is up from 6:30 to do the breakfast and start on the packing away. I am up from 7am with zzt to finish off the breakfast. Me, Matt, Jack, Izaac and Lewis do the Mucky race at about 11am, we are the only two leaders out of the whole of Drum Hill who do the race. We are beaten by an Explorer team. Get the Cornish pasties in the oven as soon as we get back. We seem sufficiently ahead that we send all the scouts off for a wide game in the woods from 1pm till 2pm. 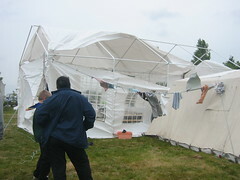 Parents arrive from 2pm and help to put down the Mess tent and Party tent. The trailer is all packed for 3pm. We have our closing ceremony and give out lots of prizes, Jack gets the best scout. The trailer is picked up just before 4pm. John Anthony has waited at the hut to help us unpack. When we drive back into the yard the Jubilee party is going ahead. It was postponed from yesterday. Enjoy a few drinks with people from the yard till 11:30. 27th May 2011. Spring Bank Camp at Drum Hill. Leaders - Annette, Rach, Prof, Matt Waterfall, Mark Bowley, Chris James, Shelly, Sarah G, Megan. Scouts - Luke Ba, Josh B, Sam A, Luke N, Edward Y, Jack E, Dan S, Joe B, Lucas W, Bredan N, Austin W, Andrew L, Luke Bu, Charlie M, Jack W.
Guides - Jessica DG, Eylisha L, Kira L, Elise W, Daisy F, Lydia P, Willow S, Amy M.
Cubs - Louis W, Zak B, Nathan M, Sean N, Owen W, Jason L, Matthew B, Josh BK, Joe B, Ross J, Sam N, Luke B, Dan M, Matt J, Elliott B.
Saturday 28th - Up at 7am and get started on the breakfast, serve bacon and fried egg cobs in plenty of time for them to go to the opening ceronony, flag break at 9am. Dad comes up during the afternoon and we have a walk round the various activities. We are both very impressed by the Aquilla Explorers high ropes course. We have a choice of chicken curry or spag bol for tea. The curry goes down very well again. They all go off to the Disco in the marqe tent at 7:30. Quite a few go in the foam bath and get soaked again. A few of the leaders have a walk down to Dave's bar for 8pm. For some reason it appears to be shut. We pursuade some of the other passing staff to open up. Overhear on the camp radio that another scout has just been sick in the foam pit. Supper of hot chocloate and biscuits. The kids are all much quiter than last night. Bed for 1am. Sunday 29th - Up at 7am for breakfast. Pete Dixon bring a young cub up called Jess. She is taken round the activities by Elliott. Me and Pete have a wander round site. Walk round underneth the ropes on the high ropes course. I have a bit of spare time so do a bit of woggle making. Sausages, mash onions and beans. Folowed by sponge roll and custard or squirty cream. Mark does a dance on stage in drag during the marquee party. Very fruity wine, Mark gives us some details of his family tree. Somehow 2am just seems to arrive. Monday 30th - I awake at 6am to the sound of heavy rain. Get up at 7am and start in the kitchen. Firstly the water boiler seems to be broken, then the gas needs changing on the large burner. A bit short staffed for quite a while, get Joe B to help as he is the next one up. I start cooking the sausages then Matt asks me, are they for lunch as well ? I quickly take them out of the pan and start cooking bacon. Send Joe down to Joan to get some more bacon. Joan works out what is required when Joe forgets what he went for. In the end we all have a great breakfast. Chris goes to flag break and we learn that we can leave the tents till Thursday because of the rain, this makes things a lot easier. The rain continues but the Mucky race still goes ahead. We have a cub, guide and scout teams. Me, Matt, Mark and Sarah form the Leaders team. Video here We all give it our best and dive into the water. Over to the water slide afterwards to get clean. We go to a very brief Spring Bank flag down at 12:30. We invest Jack W, Sam A and Charlie M. Have our flag down ceremony at about 3pm. Sean N is awarded best cub of the camp, Daisy best guide and Charlie best scout. The trailer leaves the site at about 3:15, back to the hut for 4pm, home for 6pm. 28th May 2010. Spring Bank Camp at Drum Hill. Sunday 30th - I am up at 7am to make a start. Joan comes up to help and learn about camp breakfast. Same as yesterday with the addition of scrambled egg. We are just ready in time to send them off for Scout's Own at 9am. Lammo comes up for breakfast, but somehow does not seem to get any. After breakfast Luke and a few others are assigned to my team. I explain to them that I am just keeping out of the way and admiring the view. I tell them that we are looking across at the extinct volcano near Beacon Hill, it was active about 600 million years ago. It stays fine and warm all day. Annette and I go to my parents to get the frozen mince and then go and buy a large bag of potatoes from Knifeton's farm. We all sit outside in the sunshine peeling them. For some reason the mince does not thicken as much as normal. However most of them enjoy it. Some of us walk down to have another quick word with Dave Mac. Angel Delight and cookies for supper. Monday 31st - Up at 7am and start breakfast. The scouts do all the cooking, I do the eggy bread. Start packing stuff away. 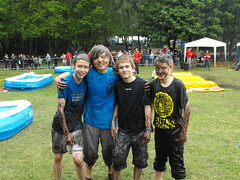 I miss the cubs in the Mucky Race, but see the Scouts. They get the fastest time for a scout team. Video They go down the water slide afterwards to get clean. Parents start to turn up from 1pm. 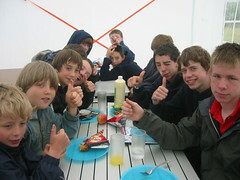 We have a lunch of cakes and cold Cornish pasties. Take the group photo at 2:30pm and then have our closing ceremony, give Best Scout to zzt and Luke Ba. Most of them then go to the official closing ceremony. Lots of parents help with taking down the party tent and packing the trailer. George takes the trailer at 3pm down to the hut. The new labelling system in the store works well to get most things back in the correct place. Leave the hut by 5pm, bath, curry and telle. 3rd July 2009. Family Camp at Drum Hill. 7 Scouts, 20 Cubs, 65 people in total. Friday 3rd July - Round to the Scout hut for 6:30pm. Lots of parents are there, Paul is late. The tents are all old ridge pole types. I think that is good, but none of the scouts or cubs have seen one before. Me and Paul have to give them a demo. Gone 9pm before we have tents up. Mark Pollard remarks that I have the same sleeping bag as when he was in scouts. Stay up till 1:30. Saturday 4th - Get up at 7am. I start a fire to do the washing up water. Build a volley ball court. Get round some of the bases helping out. The youngsters have chips for supper. From about 9:30pm we get all the adults round the back by the fire for steak and chips. There is a heavy rain shower, so come inside and watch Paul cook in the rain. Bed for 2am. Sunday 5th - Get up at 6:30am, pack away the tent etc. Leave Drum Hill at 7am to go to the Waddington air show. 22nd May 2009. Spring Bank Camp at Drum Hill. Friday 22nd - Up to Drum Hill for 6pm. We are camping on the scout field by the flag pole. We have baked potatoes with cheese and beans for supper at 10pm. Settle into the party tent from midnight onwards to wait for them to go to sleep. The May bugs start to fly. I kill about 20 with a tennis racket. Most of the tents are quiet by about 1am. We go to bed at 2am. Saturday 23rd - Me and Gary cook the usual breakfast, sausages, bacon, scrabbled eggs and beans. Set up a few things round camp, volley ball, etc. Darren comes over with a new gas light. We have a choice of chicken curry or spaghetti bolognese for tea, the curry goes very well. We all eat on the tables outside. They all go off to the Disco in the evening. Go and catch the last couple of records at the Disco, I don't recognise either of them. See a few of the scouts dancing. As soon as Daren goes Brian Counter turns up. He is hunted down by security when he stays after 10:30pm. Everyone is asleep a lot earlier than last night. Sunday 24th - Usual breakfast, they cannot tell that the Coco pops are fake. The weather really hots up and I sit outside and make a couple of woggles. For the first time in my camping career we have an electric fridge at camp, in fact two. We put them both on. We all sit outside to eat lunch. In the evening I drive over to Pete's to get food for tea. We cook roast beef, mash and vegetables. The scouts have the usual plan to try and get Rachael gunged, but forget to hand in the form, as usual. Have apple pie and custard when they get back from the Talent show. Monday 25th - Breakfast, I do big ommettes again. Gary and I make an aluminium foil oven to warm up the Cornish pasties. We then walk down to watch the mucky race. After the commentator comments that we are not setting a very good example, we offer to take part if she will. In the end we go as a team of three with Shaun M. I enjoy diving into the swimming pool and the mud, get very mucky. Have a nice warm shower afterwards. Invest Austin and Brendan. Give best scout to Adam, best guide to Christina, best explorer to Ian. Pack up camp and away by about 4pm. Back to the hut to put it all away. 22nd May 2008. Spring Bank Camp at Drum Hill. Scouts - Toby K, Callum R, Jack S, Tim A, William B, Edward B, Jordan W, Adam B.
Friday 23rd - Up to Drum Hill for about 6pm after picking up a bag of Knifeton's potatoes on the way, I am the first one there. We are camping on Fred's field with great views over Derby. There are 19 cubs and 10 explorers. Annette and Rachael sort out the kitchen. The kids have hot chocolate at about 10pm. Late on Pete tells me that he used to deliver Davenports beer using a horse and cart, I can picture him doing it and I am taken in. Saturday 24th - I do some rather good scrambled egg for breakfast, with bacon. After doing breakfast, I sit outside with Pete with binoculars watching the planes. We watch an Air ambulance circle round a couple of times and then land. It is for some lad who has fell out of a tree and broken his leg. Me and Pete in particular catch quite a lot of sun. Have potatoes, peas and fish fingers for tea. Hot chocolate later. Sunday 25th - I cook omelette for breakfast, rather good. Paul goes off after breakfast for a walk round Carsington. The roof blows off the Party tent roof at about noon. Tie a few ropes on it. Good team work on get it fixed. Have Smash, carrots, peas, cauif and roast beef warmed by gravy. Large debate about which pan to use to mash the potatoes. Early night, in bed for about midnight, leave the explorers up. Monday 26th - Run out of eggs for the eggy bread, the explorers are not happy. The cubs go off to activities. Rather windy but no rain. Start taking the tents down from about 10pm. Move one cooker into the Party tent, for burghers and sausage. We all have to work hard to get everything away. Lots of help from the parents. I am the last to leave, at about 3pm. Down to the hut to pack away and then home. 25th July 2007. 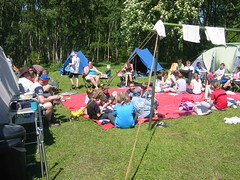 Centenary Camp at Drum Hill. Friday 25th - Pick up Annette and Rachael and up to Drum Hill for just before 7pm. We are camped right over by the golf course. We do soup and bread for supper. We have to stay up till 3am to check that the scouts and cubs are asleep. Saturday 26th - Up for 7am to get the breakfast on. Bacon, scrambled egg and beans. Fairly sunny in the morning, sit outside drinking tea after they have gone to activities. Offer teas or coffees to a few passing golfers. Have to stop Pete from shouting out 'four' a few times. Pat comes up for the day. Fish fingers, new potatoes, peas and sweet corn for tea. We all go to the Disco for a while, the scouts almost dance a little bit. Go down to the bar with Annette and Rachael to claim our free pint. Sue Sandars stays with us for the night. Sunday 27th - Lots of rain in the night. Get up at 8am, have a quick look in the scout tent and Tim presents me with a bottle of special warm lemonade. Very good Roast Beef, gravy, new potatoes and peas for tea. We all watch the Marque zzt party for a while. Take Annette back at about 10pm, to go and watch Derby on Monday. 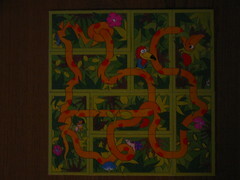 When I get back Trig shows me a little puzzle to do with fitting 8 pieces of a jigsaw together to form a snake. It says on it "A challenge for intelligent people" and it certainly is! The cubs have been trying all night. I stay up till 3am trying to finish the puzzle, get some good theories but cannot complete it. In the end I have to confiscate it to prevent myself staying up all night. Monday 28th - Wake up at 6am due to noise from an adjacent scout troop. Lie in bed listening to the rain till 7.30am, get up and put the kettle on etc. Bacon, eggy bread and beans for breakfast, the scout go to flag break to see William get presented with necker for the Brownsea Island camp by Dave Mac. William nips in for a bit of camp breakfast. We miss the entry time for the Mucky Race but they let us enter a scout team, Jack, Elliot, Tim and Matt and a cub team, George K, Freddy, Andrew and Jordan after time. Both teams enjoy the event, the cubs win their catagory. Lots of parents all turn up to help put the tents down. Dry for part of the packing away. The tents all have to be hung in the scout hut to dry. Home for a bath and a shave. Spend one more hour on the Anaconda puzzle using the same ideas as last night and solve it. Text Pete and he tells me that he has remembered that two other people have done it already! Derby win at Wembley. 26th May 2006. 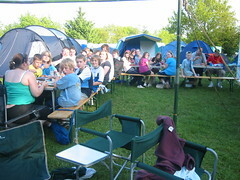 Spring Bank Camp. Saturday 27th - Take part in the Power Ball race with Annette, Ian and Paul Lambkin. Lubna, Nabila, Beccy and Lee come up to visit. Late on Charles tells Annette that there is a sheep wandering round camp. Annette creeps up on it and captures it, before realising that it is made of pot. She vows revenge! Sunday 28th - Scouts win the KeyMaster competition. 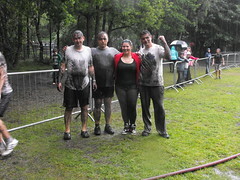 Monday 29th - We have a couple of teams in the Mucky race. Parents turn up at 3pm, raining. Lot of hanging around to wait for the tents to dry. Don't get away till about 6pm. 23rd May 2003. Spring Bank Camp at Drum Hill. 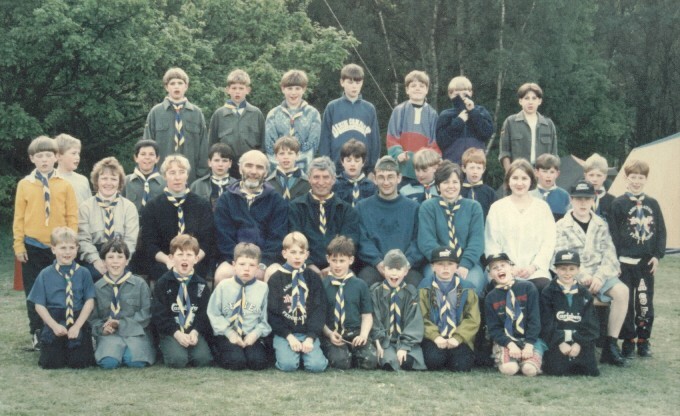 Scouts, Thomas Fitchett, James Arter, James Sandars, Karl Markham, Kelly Paternoster. Friday 23rd May - Lots of rain during the day. Drive up to Drum Hill at 6pm. We have 5 scouts. The leaders stay up till 2am waiting for the scouts to go to sleep. Saturday 24th May - The cubs are all awake for 6am. The weather becomes very nice from the afternoon onwards. Watch the scouts do lots of activities. Sunday 25th May - Visitors day, nip out to get a gas bottle later. Do the crate skating again, get 30. Monday 26th May - Fantastic weather all day. We have about four closing ceremonies. Leave at about 5pm. 31st May 2002. Spring Bank Camp at Drum Hill. Friday 31st May - Meet at the bottom of Station Road at 6pm, lots of scout parents are there. Lots of time waiting around. Get up to Drum Hill for about 7.30pm. We have 4 scouts and there are 11 cubs. Helen and Peter Taylor are there with Anna Barlow and Jane as assistants. Pete Dixon comes up for the evening. Stay up till 2am to ensure that the scouts get to sleep. Saturday 1st June - Hot weather all day. Do some crate staking. Sunday 2nd June - At 5pm we have a street party along the main camp walkway to celebrate the Queens Golden Jubilee. The weather breaks at about 7pm, good timing. Monday 3rd June - A little rain all day. The scouts and cubs enter in the 'Mucky race' This involves getting very muddy and wet. 26th Oct 2001. Camp at Drum Hill. Friday 26th October - Leave work at 2.30pm. Do five trips up to Drum Hill with Andy to get all the gear up there using just my car. The scouts turn up at 5pm. Nip home to get some things. Enjoy burning loads of wood. Saturday 27th October - Take Rachael into work for the morning. Me and Andy do some axe work and prepare a lot of wood. We take them for a walk down to Moor lane to explore the site. Have our first go on the Assault course, I get first place. Have a good time round the camp-fire till late on. Sunday 28th October - The hour goes back, all the scouts get up at 7.30am. I go and do the Windmill Dash in the morning, pick up three cooked chickens from Morrisons on the way back. Michael beats my time on the assault course so I have to have another go and smash his time with 1:22. Very tired in the evening. 28th May 1994. Spring Bank Camp at Drum Hill. Me, Tom Davis, Phil Drury, Jo Middleton, Dominic Jones, Tim Smith are there with the cubs. April 30th to May 1st 1988. Survival weekend at Drum Hill, Robert Benson, Anthony Daykin, Jimmy Knifton. They built a bivi in the woods using sticks and leaves. May 23rd to 26th 1987. Drum Hill trip with 168th. Me, Dave Elks, Robert Benson, Mark Benson, Lee Pollard, Matt Lister, Jamie Widdop, Jimmy Knifton, Charlie Binns, Jonathan Jupp, Anthony Daykin. June 1985. Drum Hill trip. Me, Dave Elks, Min, Robert Benson, Mark Benson, Matt Lister, Jonathan Jupp, Dave Jerram, Jonny Davis, Jamie Widdop, Mark Pollard, Jimmy Knifton. Friday 14th - Scouts go on combined maneuvers with Chester Green. Take all the stuff up in the car. 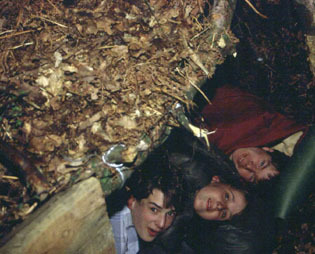 A few build bivis in the woods and sleep out. Saturday 15th - Get up at 7.30am, cook their breakfast. They play games most of the day, rounders mainly. Cook spag bol for tea, a few complaints. Take them for a wide game in the woods. Go down to the Coach with Baz. They are still running around when we get back. Sunday 16th - Up early, Chester Green lot go off to church. Set off various groups on an initiative hike staring from Drum Hill. I pretend to be a parachutist stuck in a tree and they have to rescue me. They make their way to the Pill boxes above Hazelwood for a wide game.